Mauro Banfi is a physiotherapist and also has a degree in osteopathy, from the College Osteopathique de Provence – Marseille, France. I meet him recently during the AISAC congress. AISAC is the Italian Association for the Information and Study of Achondroplasia. In this event, Mauro presented a proposal for the prevention of otitis media by using osteopathy techniques and after, he did a practical workshop, explaining some of the techniques for young child with achondroplasia. Here is a shared video of Mauro Banfi where he applies osteopathy techniques to prevent otitis media in achondroplasia. The Eustachian tube, also known as the auditory tube or pharyngotympanic tube, is a tube (like a draining channel) that links the nasopharynx to the middle ear. In the next image, you can observe where the Eustachian tube opens (entrance to auditory tube), in an area in the back of the nasal cavity. The secretions that come from the middle ear through the tube are drained to the oesophagus. The Eustachian tube consists of a bony part and a cartilaginous part. A portion of the tube (1/3) proximal to (same as next to) the middle ear is made of bone. Usually, the tube is collapsed (closed), but it opens when swallowing and with positive pressure. Specific muscles (levator veli palatini, tensor veli palatini) cooperate to open the tube regularly with a traction on a cartilaginous structure (these muscles pull the cartilage structure). But in a child with achondroplasia, these muscles do not have the same efficacy: the Eustachian tube does not accomplish an active natural opening and this leads to ear infections and fluid build-up in the middle ear cavity. This occurs because the tube does not open appropriately, causing mainly inflamation and infection, pain, rise of pression, tympanic membrane rupture (bulging eardrum ) and fever. 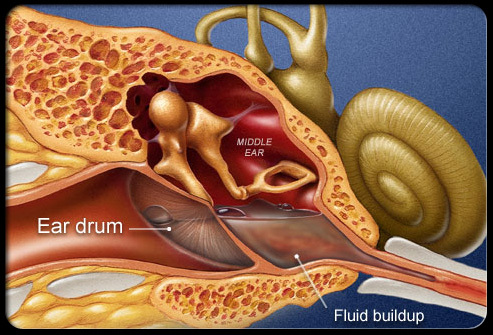 This is a tympanic membrane (eardrum) in tension, with fluid inside (the fluid is in the middle ear cavity). 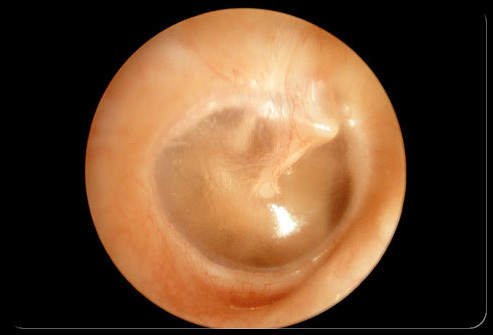 Image taken from the ear canal (outside to the inside). Credits: Eurolab. 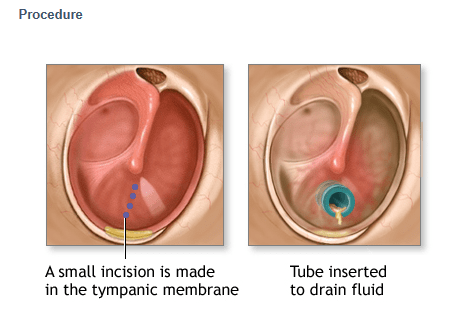 In many cases of chronic otitis media, an ENT doctor has to perform a myringotomy, which means to place a ventilation tube, in a precise location of the tympanic membrane (eardrum) to allow drainage of fluid middle ear infection caused by. In the next video, we will sho you another way to reduce the frequency of otitis media in achondroplasia. Point 1. The first idea is that Prevention is the key. So, action must be taken before the signs of otitis occur. In the next video where Mauro Banfi executes streeching techniques in a way to open the eustachian tube, allowing natural drainage of the middle ear. Point 2. Please, never try to perform these techniques by yourself without professional supervision. Ultimately, you may be refered to Mauro Banfi by your physitherapist or osteopath for evaluation of clinical cases. Point 4. By pronouncing certain sounds, it is possible to stimulate the opening of the tube. You can teach the child to produce words that contain the sounds K and GH, E and I by playing and singing together, which is easy and not invasive.